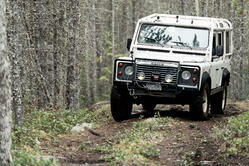 In 1998, Don had the opportunity to participate in the Local BC and Washington Land Rover Club’s North West Challenge. The event was held in Southwestern BC that year, and nothing he did could have prepared him for the terrain. 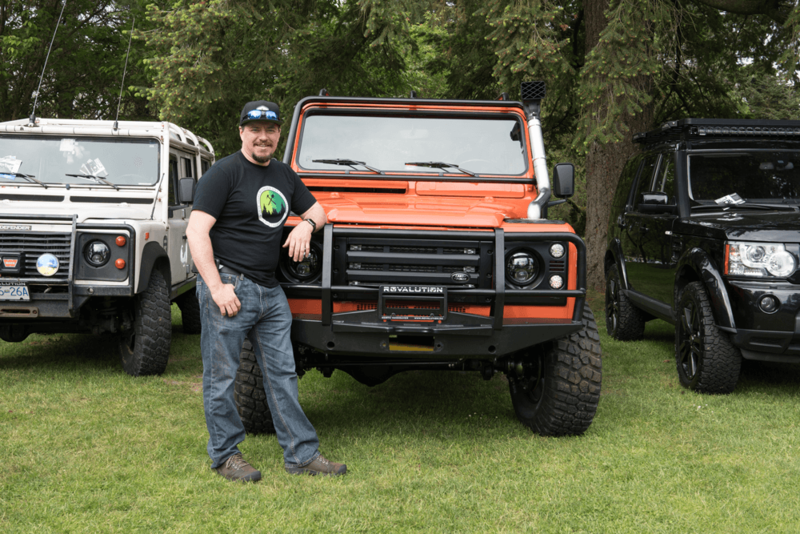 Don had signed up with his first ever restoration and his daily driver (a 1966 Series 2a 88), along with his then boss and his bosses Defender (an Off the Beaten Track, Ex-Camel Trophy Defender 110). The trail was made up of the unforgiving off-road terrain of Blue Mountain, and an old overgrown track which transformed into a series of deep mud holes. That particular section of the track was dubbed the “Camel Trophy Trail” from that day forward due to the difficulty. Watching the coil sprung V8 Defenders conquer this terrain, while his 1966 leaf sprung Series Land Rover struggled, needing to be pulled and pushed through was an eye opening experience for Don. Thus, the desire for a Coil Sprung Defender or “Special” was born. After consulting other Rover enthusiasts via an email list he was subscribed to at the time (this was pre-internet forums) and deciding that Defenders were either too expensive or simply unavailable, Don decided on converting an old series into a coil-sprung V8 or TDI. This allowed for a similar body style, better off-road clearance, the capability of coil suspension and a modernized version of a Range Rover Classic-producing something similar to a Defender. Then came the time for research. Would it be better to buy a pre-made coil chassis and convert the existing Series 2a, or build a new truck from the parts of an old Series and Range Rover coil chassis? This was answered in the form of an ad on the local Buy ‘N Sell classifieds for a right-hand drive 1978 Range Rover. It was priced reasonably, so after convincing his partner Karen to go in on it, they picked it up in White Rock and drove their new truck home to North Vancouver. After several unsuccessful attempts to turn it into a reliable running vehicle for Karen, Don admitted defeat because of the rust and how much work was ahead of him. So the ruse was up, and Don got his donor coil chassis for the project. The chassis and parts sat disassembled in the garage and backyard, and after moving house twice, it slowly turned into a distant dream, as with most project cars. Even though Don’s dream was put on indefinite hold, he stayed resolute that someday he would transform all these parts into a coil chassis off-road buggy. 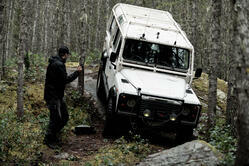 In the Spring of 2007, the opportunity came about for Don to purchase one of the 25 Canadian NAS Land Rover Defender 110s-which soon became known as White Rabbit, and served as the family vehicle. The Rabbit was used for family vacations, and everyday trips to work and the grocery store. The Rabbit was also surprisingly competent off-road, and has participated in a number of the North West Challenge events over the years. While the Rabbit was well-loved and well-used, it was never going to be the truck that Don was willing to risk major off-road damage too. 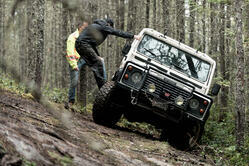 It was also bigger and heavier than most of all the other Challenge trucks and Don longed for something more intense. 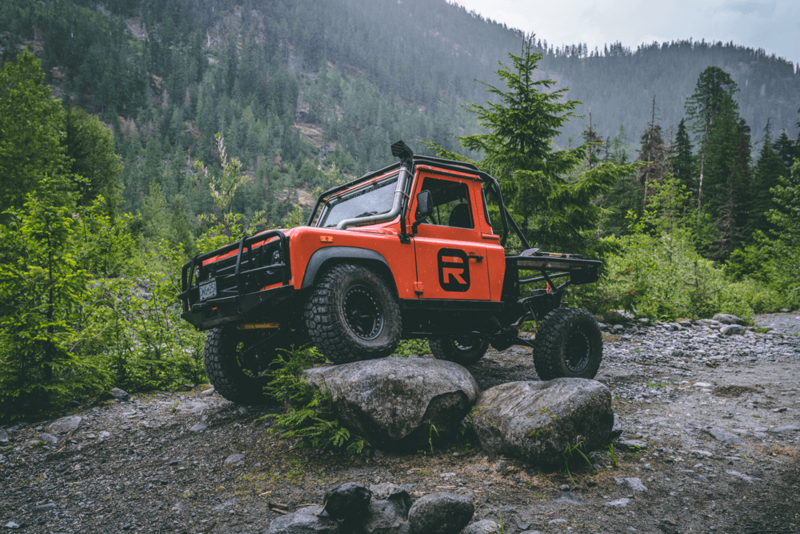 Something able to conquer the North West Challenge with ease, and the answer was sitting in his backyard: the not forgotten but forever pushed to the side pile of parts from a 1978 Range Rover, 1960’s Series 2a body, and a Defender 110 Chassis. Now, how to get there. Running Rovalution, working on customer vehicles, and having a family with young children left little time to work on his dream truck. Don would go through spurts of motivation and hard pushes to overcome whatever obstacle arose to get the Buggy to what it needed to be, but each push would inevitably be met with an obstacle. If you’ve ever built a project car, you can relate. There were a few times when the Buggy neared completion-but never quite got there. On February 18th, 2017 the unfinished Buggy was revealed at the annual Rover Lander Founders Day in Chilliwack and was a smash hit. Everyone was drawn to it, like the inevitable pull of a project going on in your neighbour’s garage. As with most partially completed projects, everyone was eager to give their opinion on how best to finish it, and wanted to know everything about it-especially, when it would be ready to run both on and off-road. Despite Don’s passion for the project, he returned to Rovalution burned out and had to put the buggy on the back burner again while he focused on the business. Eventually though, the cycle continued, and Don along with everyone at Rovalution pulled together for the final push. 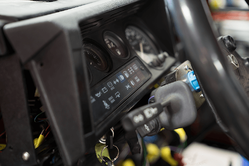 All the details surrounding the engine and transmission for fuel, electrical, exhaust and cooling were slowly tackled one at a time and everything was beginning to come together. The cage was finished, lifted off the vehicle and painted in house. The all important Rovalution ‘R’ was applied to the doors, lights were hooked up, and more parts arrived for the project. As the deadline of the All British Field Meet in May of 2018 approached fast, the all nighters became a regular occurrence, and days began blurring into one another as the date loomed closer and closer. The night before the meet, all hands were on deck. Pizza boxes lay strewn across tables and the Buggy was covered with people working tirelessly to finish. Some were working on the rear tail lamps, other spray painting washers to match the rest of the hardware, while others puzzled over the last few electrical issues. In the wee hours of the morning, the buggy started up with a thick cloud of black diesel smoke and rowdy cheers from the staff. The completed Buggy rolled out of the shop under its own power for the first time in the middle of the night, tearing up and down the alley over and over with Don at the helm, smiling ear-to-ear. After a few test runs and adjustments, the Buggy rolled back inside and everyone went home to get a couple hours of sleep before the all day meet, beginning a few hours later at 7AM. At 8AM (they slept in) that morning, the White Rabbit, an LR4, and of course, the Buggy were on the road. Heads snapped to the sound and unique sight-people were pointing and taking photos of them everywhere they went. Rolling into the All British Field Meet was a satisfying experience for Don, as all eyes were on the Buggy. Everyone wanted to know what it was, how long it took, and others inquired how much it would cost to call it theirs. The end of a 20 year project had finally been reached, and the Buggy was christened in the most fitting way-with an off-road run in Squamish. While there were some minor issues and tweaks needed (mostly from getting stuck in deep snow) the Buggy performed like a champion. 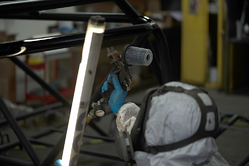 Want to learn more about the Rovalution Buggy? Let us know in the comments below and keep an eye out for an upcoming film on it!